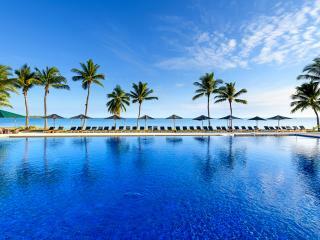 Fiji Early Bird Offer: Save 10%! Grand West Villas is located on the picturesque Wailoaloa Beach, approximately 10 minutes from Nadi International Airport. Set within 4 acres of lush tropical gardens, these apartments provide excellent value for money for the budget-conscious traveller. This Fiji accommodation features 20 self-contained two storey two bedroom apartments with a fully equipped kitchen and private balcony. Grand West Villas has 10 comfortable one bedroom apartments as well as 10 studio rooms that overlook the tropical gardens. There are a number of onsite facilities including a lagoon pool with a water slide as well as tennis courts, a restaurant and bar. 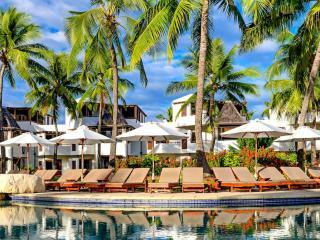 Just a short stroll from Grand West Villas you will find Nadi Bay Beach and Nadi Airport Golf Course. Grand West Villas consist of studios, and 1 and 2 bedroom apartments that are ideal for a short stop over. 1 Bedroom Apartment: Features microwave, lounge area and private bathroom with bathtub. Bedding is 1 Double Bed + 1 Single Bed in the lounge room. Maximum room capacity is 3 Adults OR 4 Adults & Children. Grand Wests Restaurant & Bar: Dine al fresco on the deck and take in the view out over the swimming pool and lush tropical gardens while enjoying the fine international cuisine and exotic cocktails. Just a short distance from Grand West Villas is the Nadi Airport Golf Course, the most scenic course in Fiji. Boasting ocean, island and mountain views, this 18 hole golf course features a pro shop, club house, licensed bar, beachside dining, driving range and private lessons. Good pool and slide; spacious rooms; beautiful gardens; very helpful staff; some aircraft noise; kitchenettes could be better equipped; allows you to get a better feel for Fijian life than you would at a 5-star Denarau resort.